Disasters are increasing in frequency and severity worldwide. Due to population aging, older people are increasingly affected. 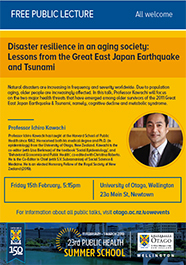 In this talk, Professor Kawachi will focus on the two major health threats that have emerged among older survivors of the 2011 Great East Japan Earthquake & Tsunami, namely, cognitive decline and metabolic syndrome. Professor Ichiro Kawachi has taught at the Harvard School of Public Health since 1992. He received both his medical degree and Ph.D. (in epidemiology) from the University of Otago, New Zealand. Kawachi is the co-editor (with Lisa Berkman) of the textbook "Social Epidemiology", and "Behavioral Economics and Public Health", co-edited with Christina Roberto. He is the Co-Editor in Chief (with S.V. Subramanian) of Social Science & Medicine. He is an elected Honorary Fellow of the Royal Society of New Zealand (2019). See details of all 4 Public Lectures for the 2019 Public Health Summer School.